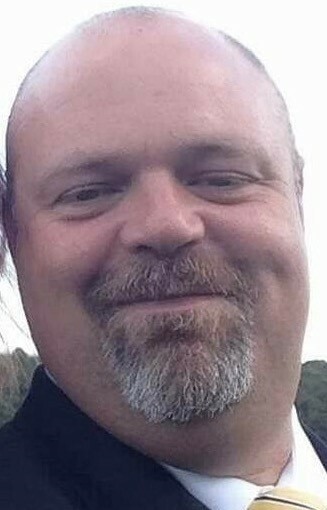 Positive response was the inception of two positive dog trainer friends, Dee Scott and Matt Norton who were passionate about helping people and their dogs. 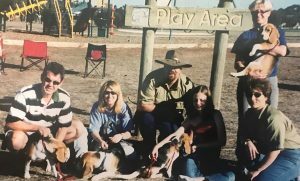 They volunteered their time at Keilor Obedience Dog Training Centre in Melbourne, (the first club to use ONLY reward based training) for many years and taught a variety of classes. Many clients had home issues that could not be dealt with in this environment and one day, pen and paper in hand and drinking numerous cups of coffee – Positive Response was b orn. Pictured here are Matt and I with our very first Positive Response Graduates. We were asked to train a group of beagles. Who could resist. The business office is based in the heart of the Redlands, with four training locations for our group classes. Click here. The business offers a variety of training options click here. Browse around in our online shop for your pet and check out our interactive E-Books – coming soon that can answer many of your questions. Dee and her staff are specialised trainers, working with a variety of issues using force free training. Our staff undertake complex, nationally recognised trainer courses. They are also mentored by Dee and undertake an in-house training program prior to qualifying. This enables us to provide a high standard of service to the community with exceptionally qualified staff. The business owner, Dee Scott holds national qualifications as a Behavioural Trainer with over 30 years of extensive experience in the dog world. 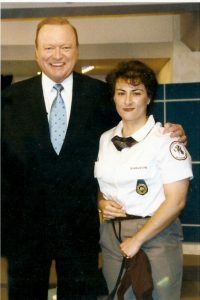 She spent 6 of those years working as a Quarantine Detection (sniffer) dog Handler at Melbourne International Airport w ith her detector dog Phantom while training other handlers and their dogs. “Watching Border Security is exactly what my average day in the office was like.” Dee has taught in many obedience clubs over the years, helping to introduce fly-Ball; a fantastic dog sport to Australia. Whilst living in Canberra she competed heavily in obedience, fly-ball and agility with her home dog Isaac. She has appeared on The Bert Newton Show, Channel 9, and in local newspapers and editorials. 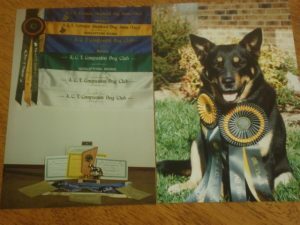 Committee member and Junior Trainer with local Dog Club, New South Wales. Moved to Canberra where she joined CDC Dog Club in Narrabundah. Instructed there for 5 years, coaching all levels of obedience and promoting a dog sport called fly-ball within the club. Competed in dog obedience, fly-ball and agility trials with her home dog Isaac, always with very high scores, bringing home many trophies and prizes. 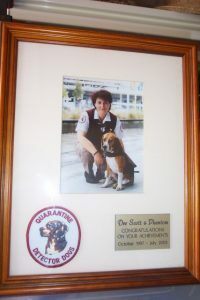 1998 moved to Melbourne to take up a position with Australian Quarantine Inspection Services as a Detector Dog Handler. Worked with detection beagles at Tullamarine International Airport. Moved to Queensland where Positive Response Dog Training has been up and running since May 2005. Isaac (1992- 2009) – From rags to riches, click here to read my story. Phantom (1996- 2014) – The life of a detector sniffer dog, click here to read my story.